Sunshine, Storm and Lightning — Patricia H. Ladew Foundation, Inc. It was a triple header when this wonderful family saw Sunshine, Storm and Lightning. Originally wanted kittens, they couldn't leave mom, Sunshine, behind! All three are doing great in their new home! 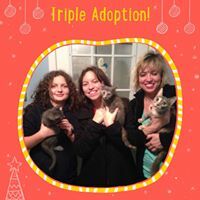 They were adopted on 12/6/2017.